Senusret II, the birth name of the fourth king of Egypt's 12th Dynasty, means "Man of Goddess Wosret". It was the name that seems to enter the royal linage because of this king's non-royal, great, great grandfather, the original Senusret and father of the founder of the Dynasty, Amenemhet I. Senusret II's name is also found in various references as Senwosret II, or the Greek form, Sesostris II. His throne name was Kha-khaeper-re, meaning "Soul of Re comes into Being". We are told that he succeeded his father, Amenemhet II in about 1895 BC, after a short co-regency of at least three years. References differ on the length of his rule, varying between about seven and fifteen years. The Oxford History of Ancient Egypt gives his reign as 1877-1870, while Clayton gives him a reign from 1897-1878 BC. A group of statues was discovered, two of which had been usurped by Ramesses II, portraying Senusret II with wide, muscular shoulders like his father, but with a more vigorous face, lacking the blandness of older 12th Dynasty statuary. Indeed, this was a period of fine portraitures art, reflected in the distinctive broad cheekbones and other characteristics portrayed in the statues. In fact, even a number of private statues have been found that also reflect this high art, and the late 12th dynasty is seen as a milestone of human portraiture in Egyptian art. 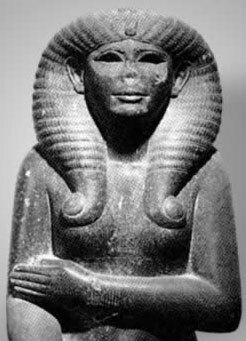 Better known then Senusret II's statues are a pair of of highly polished black granite statues of a lady Nefret, who did not carry the title of "Royal Wife", but who was probably either a wife of Senusret II's who died before he ascended the throne, or a sister. She did, however, have other titles usually reserved for queens. His principal royal wife was Khnumetneferhedjetweret (Weret), who's body was found in a tomb under the pyramid of her son, Senusret III at Dahshure. 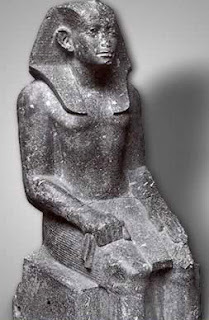 Senusret III would become Senusret II's successor, though so far their is no evidence of a co-regency with his father as their had been for every king from the time of Amenemhet I. Senusret II probably also had several daughters, one of which would have probably been Sathathoriunet (Sithathoriunet) , who's jewelry was discovered in a tomb behind the king's pyramid. Like his his father's, Senusret II's reign is at least considered to be a peaceful one, with more diplomacy with many neighbors then warfare. We are told that trade with the Near East was particularly prolific. His cordial relations with the regional leaders in Egypt is attested to at Beni Hassan, for example, and especially in the tomb of Khnumhotep II, who he gave many honors. In fact, we are told of no military campaigns during his rule, though he undoubted protected Egypt's mineral interests and their expanded territory in Nubia. His efforts seem to have been more directed at expanding cultivation within the Fayoum rather then making war with his neighbors and regional nobles. In the Fayoum, his projects turned a considerable area from marshlands into agricultural land. He established a Fayoum irrigation project, including building a dyke and digging canals to connect the Fayoum with a waterway known today as Bahr Yusef. He seems to have had a great interest in the Fayoum, and elevated the region in importance. Its growing recognition is attested to by a number of pyramids built before, and after his reign in or near the oasis (though the Fayoum is not a true oasis). It should also be remembered that kings usually built their royal palaces near their mortuary complexes, so it is likely that many of the future kings made their home in the Fayoum. 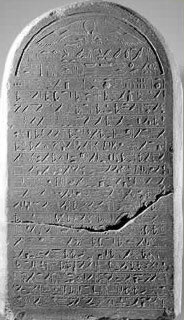 These later kings would also continued and expanded upon Senusret II's irrigation projects in the Fayoum. Senusret II built a unique statue shrine of Qasr es-Sagha on the north eastern corner of the region, though it was left undecorated and incomplete. His father, Amenemhet II built his pyramid at Dahshure, but Senusret II built his pyramid closer to the Fayoum Oasis at Lahun. His pyramid definitely established a new tradition in pyramid building, perhaps begun by his father. But, for example, beginning with Senusret II, the location of the door was less important from a religious then from a security standpoint, so rather then being on the north side of the structure, it was hidden in the pavement of the south side. To the south side of the pyramid Petrie excavated four shaft tombs that belonged to Senusret II's family and in one of these, discovered a fine, gold inlaid uraeus that may have come from the king's mummy. Senusret II is further attested to by a sphinx, now in the Egyptian Antiquity Museum in Cairo and by inscriptions of both he and his father near Aswan. It should also be mentioned that the pyramid town associated with Senusret II's complex, known as Lahun (Kahun) after the nearby modern village, provided considerable information to archaeologists and Egyptologists on the common lives of Egyptians. Pyramid towns were communities of workmen, craftsmen and administrators that grew up around a king's pyramid project.